Nobody teaches you how to be a teenager and the person you’ll become is not the same as the person you are at this moment. Regardless of how adult you feel, you’re still learning, changing, choosing, improving|There is knowledge to be had and experiences yet to unfold. You’re still collecting your own personal data, talents and strengths. How can you know exactly who you are until you know through personal experience, trial and error who you’re not? You’re an individual soul on an individual real-time life journey, a journey that you will write, re-write, program, source and create for yourself over and over” many times. What you’ll eventually do and become is determined by choices, intentions, decisions and options available as you go along. Cause and effect will also play its part depending on the way you act and choose. You are not at the mercy of anyone else; instead you are writing your own script! Be the best version of yourself that you can be at any given moment, situation or opportunity. Learn all you can from the present and the past and from life as it unfolds continually all around you. Be open and honest. Use morals and integrity. Aim high, but be sure to keep things grounded and real. You are responsible for the life that you personally own” so be aware of actions you take and words that you deal! You’re a living breathing work of art in a state of constant progress, you’re creating and expressing even now as you read these words! Nothing about you is haphazard. You choose your presentation, clothes, hair and makeup, the food you eat, music preferences, what you laugh and cry at, books you read, TV programs, films, hobbies and games you play, the type of friends you chill and mix with, how you spend your free time, conversation, sense of humour and more besides. As a teen your ideas, beliefs and input into life are very important. You deserve to be happy, fulfilled and understood. Between raging hormones and what others expect, life for you is not always easy. 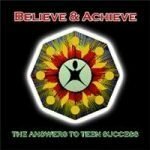 Believe & Achieve (my latest book) is especially written to help you to succeed in every way. You are powerful and completely unique. If we help you recognise the many talents you possess” your life will very easily be incredibly wonderful. You are the next wave of conscious intelligence born to take humanity forward. The past you cannot alter” but the ‘here and now’ is absolutely your time” and how you choose to use and mould it births in the future. Too old to be cute and too young to be old, teens are often overlooked or branded as troublesome, difficult beings. As we take a look around at the world you’ll inherit” it’s easy to understand the frustrations you feel. You chose to birth at this time, though today you may not understand or even know it. You chose your parents, your siblings and surroundings before you even came here. You chose the conditions of your life lived so far” deliberately, again for a definite purpose. You have a soul agenda, things you wanted to experience and things that you must do, that will also aid society and the larger world view picture playing out” as well as you! This world is your oyster. Your life can be everything you want it to be very easily; you just need to know how to achieve it. Never before has a time frame like this one existed. We are at the brink of something special. A new world order is birthing through” and you especially birthed to play a living part. You are the promise of the future that will take humanity forward” back to a place of balance, peace and fairness. You will be kinder to the planet than generations so far, through lessons your ancestors faced. You fill the whole world with excitement. The old ways of living are falling apart, the new is fast birthing and you are a part of that movement. On a karmic level” the world is in waiting for you to step up to the tasks that you came to fulfil. Believe & Achieve was written to help you grow forward. Life is easy when you know how to read it and when you can recognise its signals and signs you’ll know how to harness and work it more effectively. Nothing is beyond your capability and understanding. You have the whole world at your disposal. You have only to realise and use it. This really is a great time to be young with your whole life ahead and unwritten. The wisdom of the past is yours to understand, to help you put today in perspective. Life is not getting worse” it’s simply re-adjusting. The old is making way for the new. Believe & Achieve is written like a deck of cards” just in a book. It’s like a breath of fresh air that will bring you answers and freedom. Hold it between the palms of your hands for a few moments and let yourself relax. When you feel ready fan through the pages” or electronically move the button that allows pages to shuffle. If it helps you” close your eyes. Make sure you actually work through every page. Keep on going for as long as you wish” in tune with any feelings you might have. There’s no need to ask a question, just relax. When you feel you’ve done enough stop with the pages closed. Again, go with what you are feeling. Fan again through the pages and without looking down or thinking” open the book or look at the place you feel you are drawn. If your eyes land on a heading number” just read down. If you land somewhere in between” you are mid text, so travel up to the beginning of that section, which might even be on the page before. If you are not sure exactly where you landed or you feel drawn to another section” then read them both. Both might apply to you at the moment. If you can, use this book at the very least every morning, that way you’ll know for sure that the information being given is up ahead. Sometimes Believe & Achieve can be so precise that, when you use it in the evening you can wonder whether it’s talking about the day you’ve just had or the one that’s ahead, so to use it in the morning avoids confusion. Use it as many times as you want to throughout the day” in the same way you just did, if something happens to you or around you, if a question or a thought pops into your head” whether it’s directly linked to you or not, just pick up the book and see. When something passes through your consciousness, your mind, there’s a good chance that you can help / do / or change something about it. You can take this book to school/college/work, you can share it with friends and with family, but they must also repeat the procedure to connect! There is no such thing as energy contamination here. The point of shuffling is the point of energy transference and connection. When you get your book back from another person just repeat the whole shuffling thing again to link it to you! Because this is a live, working tool designed to help you, we suggest you place it in a place you’ll often see it. The more you do, the more it can give you, the stronger the connection and the greater the asset it will be as it helps you with your life daily. On days when you are clear or you’re in an OK place, you’ll sometimes get something for someone else who will cross your path, someone who at that time may need your assistance. Just remain aware and pass the information on when it arises, and in doing so you’ll be performing a service of higher value for life itself! Together we really can combine Heaven and Earth as one” to cultivate peace, understanding, balance, truth and love. Together we can help mend life and planet! If you have enjoyed what you’ve just read, if it’s resonated within at any level, then the material we’ve channeled/downloaded (in much the same way as Einstein and Mozart produced life changing works) will work directly in tune with your life now. You know all thoughts you are currently thinking. You know how you feel and what you most need to come in. You know what is happening within your own circle of life” as well as for friends and family too; you know what should happen and what is lacking, and it’s from this vantage point immediately that guidance will be given” to take you forward with ease, to help you succeed, to get your whole life working better and you working with it, completely in tune with where you are! If you continue along the same lines you always have” you’ll simply attract more of the same. For things to get better, for you to get happy and stay that way, you need to understand how you hold yourself back, how you too add to and program this life as you do. You are powerful. You are strong. You are not broken” but a necessary working part of creation itself!